When North Carolina lawmakers heard proposals in June to dramatically revamp how charters are funded, public school advocates pleaded for more time. The bill before the chamber, a state Senate draft authored by a staunch charter supporter would have bound traditional K-12 schools to grant charters access to more pots of public funding. Lawmakers, concerned about the precedent of authorizing such a major change in funding during the chamber’s short session, deferred until next year. Some said the additional time meant a better chance of compromise in North Carolina’s annual tilting match between traditional schools and charter supporters, who claim that publicly-funded charters are being short-changed by their traditional school counterparts. 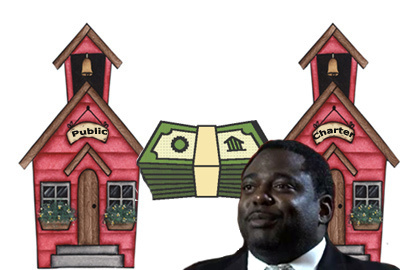 But this week, after one of Raleigh’s most outspoken school choice backers, former state lawmaker Marcus Brandon, suggested charter leaders file a class-action suit against every county in North Carolina over funding, leaders on both sides seem farther apart than ever. “I just don’t know what he’s talking about,” says Leanne Winner, director of governmental relations for the N.C. School Boards Association (NCSBA), a group that represents local school boards at the General Assembly. Leaders in both camps have been debating charter funding in North Carolina for years, particularly since a 2010 amendment by Democrats in the legislature denied charters access to certain funding sources, such as sales tax revenues, gifts and grants traditionally bound for public school coffers. That includes funding grants for school lunch costs, with most traditional school supporters pointing out charters are not required to offer lunches to their students. As it is today, local school districts are required to transfer state allotments of funding to charters in their district based on attendance, but that method has spurred multiple challenges from charters who claim they are being bamboozled by local districts. This week, Brandon, a former High Point-area legislator who now heads the school choice advocacy group, Carolina CAN, told members of the right-leaning John Locke Foundation in Raleigh that charter supporters need to be more “forceful” on the issue in the coming days. “This is money that charters are owed,” Brandon said, adding that he believes charter supporters will eventually win out in the funding battle over traditional schools. But leaders on the opposing side seem nonplussed. “Any kind of lawsuit against school districts, especially any kind of broad action of any kind, that certainly seems to be premature,” said Katherine Joyce, executive director of the N.C. Association of School Administrators (NCASA), a Raleigh group that speaks for administrative leaders in local school districts. Chiefs with the administration and school board groups were integral parts of a bipartisan compromise bill, House Bill 1111, which stalled early in the 2016 session. That legislation would have ordered state officials to fund charters directly like city-school administrative units, or subgroups of public schools governed by local boards. The bill would have bypassed transfers from local districts, and, according to Joyce, sped an additional $300 million or so to charters statewide, but the draft failed, chiefly because charter groups balked on the proposal, she said. Meanwhile, this week, Brandon called North Carolina’s public school sector a “horrible system,” urging the state to pursue a decidedly more “free-market” approach. His group backed such efforts in the legislature this year, including bills that legalized for-profit charter takeovers of low-performing public schools and a massive boost to the state’s Opportunity Scholarship Program, which provides public funds for low-income children to attend private schools. But when it comes to charters’ share of public funds, school-choice leaders in North Carolina like Brandon remain unsatisfied. Indeed, Rep. John Bradford III, R-Mecklenburg, told lawmakers this year that urgent action is needed to address a “huge inequity” in funding for charters. But Joyce says the two parties simply need further conversation, not lawsuits. Winner, meanwhile, says the two parties need a “broader discussion” of how to systematically fund charters, rather than focusing on specific funding sources and grants excluded to charters. “We have made it very clear as a public school community that we are willing to sit down and try to figure out these differences,” said Winner.